The instruments on this page are one of a kind instruments with the absolute finest​ appointments available in the industry today. I'm searching every tone wood supplier I can access for the most incredible woods available. There will be no excuses; there will be no compromise; these mandolins will be collector quality pieces in every sense of the word. 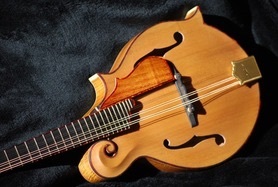 The Koa F-5 shown here is representative of a Master Series Mandolin and is available for purchase (click HERE or on the photo to see a slideshow on this magnificent instrument). No two instruments will be alike; The wood combinations will be stunning; the finishes will be the best available. I apply very thin coats of varnish during the final finishing process which lends to an incredible looking and sounding instrument. Whether finished in a high gloss or a subtle satin varnish finish you will hear and see the woods extraordinary quality and unsurpassed beauty that will be available for purchase. The instruments in this series will be truly spectacular; tonally and visually!! Please stop back and check for availability.